 The Second Grade program at Dade Christian School challenges students to reach their full potential as they develop their skills in the intellectual, spiritual, physical, and social realms in a fun and loving educational environment. Our curriculum is a thoroughly integrated, academically balanced program with a consistent Christian emphasis. Bible, Language Arts, Phonics, Reading, Math, Science, History, Spelling, and Penmanship all represent the subject areas. An emphasis is also placed on social interaction among the students, giving them opportunities to develop social values; respect, sharing, group acceptance, independence, and dependability. Students will receive spelling lessons that will help them to apply their phonics and language skills as they become skilled spellers. Spelling skills will enable students to become good writers and help them build words, sentences and stories. Daily oral and written reviews, activities and contests will encourage students to continue to build strong spelling skills. The purpose of reading class in second grade is to teach reading through phonetic analysis, structural analysis, sight words, context clues and dictionary skills. Students will develop an enthusiasm for reading, independence in word recognition skills, comprehension skills and build Christian character and a love for literature. Decode words with short vowel sounds. Demonstrate ability to use content page. Demonstrate ability to recognize titles. Recall facts and details about story characters. Demonstrate understanding of quotation marks. Relate the story title to main idea. Recognize emotional responses of characters. Demonstrate ability to follow directions. Infer supporting details about characters. Recognize the importance of obedience. Discriminate between characters in oral reading. Read punctuation marks that develops sentence meaning. Recognize the importance of friendships. Identify with a story character. Recognize the reality of a historical account. Use varied voice inflection in response to punctuation signals. Demonstrate comprehension of pictures and sentences. Recognize the importance of prayer. Recognize the importance of responsibility. Develop awareness of sound patterns in poetry. Read a poem together as choral reading. Infer likeness and differences in characters. Recognize the importance of cheerfulness. Understand the importance of sharing. Note compound words with parts that are related to meaning. Demonstrate ability to use the contractions: I’m, I’ll and I’ve. Recognize that different words can have similar meanings. Develop ability to contrast one word with another word with an opposite meaning. Identify fanciful elements in story content. Demonstrate ability to find solutions to problems. Recognize how characters view problems differently. Identify true and false statements. Interpret pictures literally for details concerning elements of setting. Draw inferences from picture interpretation. Recognize the elements of fable. Recognize the use of ‘s in forming possessives. Demonstrate ability to follow directions on a map. Recognize that different words can have the same spelling. Use context clues within a sentence to correctly pronounce homographs. Learn meaning for specific frequently used homonyms. Recognize the importance of giving one’s best to the Lord. Infer the motives of characters. Identify common meanings of the prefix un- and mis-. Find the relationship between pairs of words that form analogies. Recognize abbreviations: Dr., Mrs., Mr., St., and Ave. Select a title related to the main idea. Determine number of syllables in a word. Understand the plan of salvation. Focus on the author’s use of pronouns. Relate story content to biblical principles. Use contractions correctly in sentences. Use alphabetization skills to locate words in glossary. Handle books with clean hands. Keep books clean and never write in them. Story: Get Up and Go! The purpose of second grade language is to give students the very best experiences in listening, speaking, reading and writing so that they will be able to think and communicate with increasing skills and confidence. Read and respond to sentences that tell about pictures. Use details in a picture to write a sentence that tells what the picture is mostly about. Writing process: prewriting, drafting, responding and revising, proof reading, publishing. Naming part of a sentence. Telling part of a sentence. The curriculum is designed with a phonetic approach to teaching reading and learning how to read. Reading skills are developed through the mastery of all of the special phonics rules and the logical phonics system. A natural love for reading is developed in students as they are exposed to interesting, challenging, and well written texts that are also geared toward the development of Christian character. The students will gain knowledge of phonics by oral teaching, reviewing the phonics charts, flash cards and clue word cards. The students will then be able to apply these rules to words which will enable them to read fluently. Word division: between double consonants / root words and suffixes / a vowel and a consonant. The purpose of Bible teaching is to lead children to know Christ and build Christian character. Children will learn about Old and New Testament Bible stories and how these stories can apply to our daily lives. Weekly Scripture memorization will allow the students to hide God’s Word in their hearts and at the same time share God’s love with others. recall details of Bible stories. recite books of the Bible in order and locate them.